You've cleared your schedule and the weather's on your side, so you're keen to head off on an epic day hike or a minimalistic overnight adventure. First though grab Lowe Alpine's lightweight Trek+ AirZone backpack to ensure all that you need to carry, you can in comfort and with speed. You&apos;ve cleared your schedule and the weather&apos;s on your side, so you&apos;re keen to head off on an epic day hike or a minimalistic overnight adventure. First though grab Lowe Alpine &apos;s lightweight Trek+ AirZone backpack to ensure all that you need to carry, you can in comfort and with speed. Lightweight trekking means you can crank up the pace and let&apos;s face it, that can mean a sweaty back. Not so with the improved adjustable AirZone Centro back system delivering extra ventilation by reducing contact and allowing air to flow freely between your back and the pack. Meanwhile the wrap around hipbelt offers increased support, giving you in return the best possible fit and stability especially over uneven ground. Allows you to carry more gear when needed. The expanding volume is expressed using two measurements, 45:55. 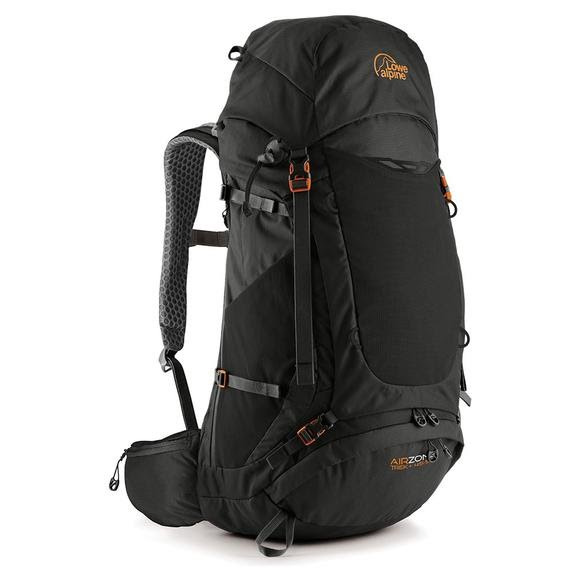 The AirZone tensioned mesh lifts the pack away from the wearer&apos;s back, allowing air to flow freely. The large cut out space reduces weight and allows air to move freely between the pack and the wearer&apos;s back. A stretchy front mesh pocket offering easy, on the go access to items such as a waterproof jacket or a helmet. The chest strap is adjustable to give a precise fit. Use the webbing loops to find the optimum position. Measurements Back Length: 18"- 20"